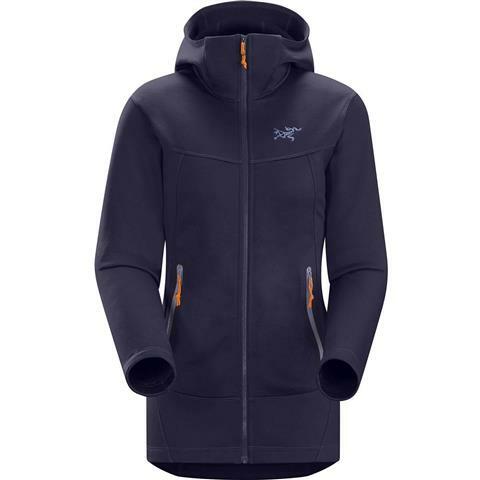 Designed for the female athlete, the Arc'teryx Arenite Hoody is the warmest fleece in its collection. It can be worn as a midlayer or as a standalone jacket. The Cobblecomb™ fleece provides soft and effective insulation that resists pilling under a shell. The The Cobblecomb™ fleece also offers effective warmth and breathability with free range of motion. The tall collar keeps out wind and is snug but not too tight. When paired with an Arc'teryx shell, the two unite in a system designed to move with you down the mountain. + Wash dark colors separately. + Iron on low heat. I LOVE this piece for spring and fall as a stand along jacket or in the winter layered under a shell for skiing. Its so versatile and the colors are great! I'm 5'7 and very few pieces feel "long enough". This one fits the bill. This hoody is so warm! Great layering piece, the hood adds an extra layer for warmth when skiing downhill. Great colors, you will love this jacket! Fantastic and versatile layering piece. This is my go to everyday hoodie that I wear all fall, winter, and spring. Great warmth layer underneath my ski jacket as well. I wear this almost every single day!